MSF teams are responding to an Ebola outbreak in the North Kivu province of the Democratic Republic of Congo (DRC). Our teams have set-up isolation and treatment units and are providing support for the local healthcare system to remain fully functional. MSF continues to work on other projects in the region. The tenth Ebola outbreak in the Democratic Republic of Congo was declared on 1 August in the North Kivu province, in the north-eastern part of the country. So far, health authorities have reported 91 cases (64 confirmed, 27 probable). 50 people have sadly died, 12 suspected cases are being investigated. MSF is working within the framework of the Ministry of Health’s response plan. During the first week of intervention, our teams set-up a treatment unit in the town of Mangina, the epicentre of the outbreak, including 30 beds inside isolation tents. Another isolation unit has been installed in Beni, a city with a population of 400,000 people, approximately 45 minutes away. MSF is also providing training on 'infection prevention and control' to existing health centres in the surrounding area. This is one of the key elements of the response, making sure that the rest of the health system remains functional in order to preserve continuity of care for any other type of patients. “There are several challenges we have to face” says Gwenola Seroux, an emergency manager for MSF. "It is the first time we face an Ebola outbreak response in an area of conflict. This is going to make the response all the more difficult, especially in terms of limiting the spreading of the disease in areas difficult to access. 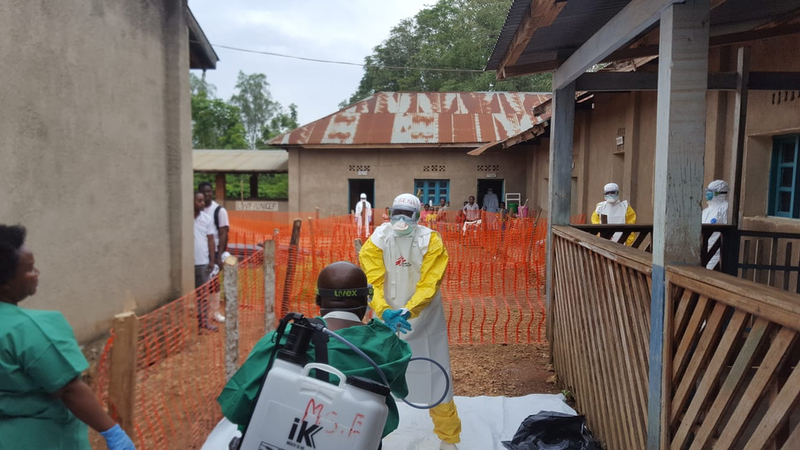 Other MSF projects in the region have also raised their level of alert and put in place procedures to safeguard their existing activities from the risk of contamination. These include MSF programmes providing care for paediatric and malnourished patients, and victims of sexual violence in Lubero and Bambu-Kiribizi, as well as a hospital in Rutshuru. Around 800 people who have been in contact with Ebola patients have already been identified by the health authorities and are being followed-up with to monitor any early symptoms of the disease. More challenges will be presented due to the context of the outbreak: the region has long been characterised by ongoing violence. “It is the first time we face an Ebola outbreak response in an area of conflict,” says Gwenola Seroux. The area is also very close to the border with Uganda and the authorities in Kampala, the Ugandan capital, have called for their citizens to be on high alert. MSF teams on the Ugandan side of the border have been equally reactive, and are collaborating with the national authorities in case an intervention may be called for.